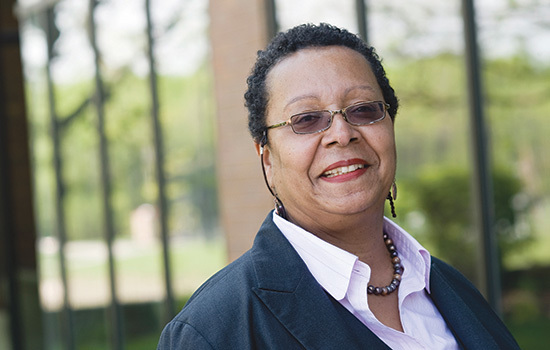 Dean dt ogilvie is looking ahead to the future of the E. Philip Saunders College of Business as well as to the contributions she can make to the Rochester community. Professor dt ogilvie is the newly appointed dean of the E. Philip Saunders College of Business. She recently spoke with University News senior communication specialist Marcia Morphy about her vision of the college over the next several years and how her professional experiences have positioned her for this leadership role. Question: Why is your name in lowercase letters? Answer: It’s lowercase on my birth certificate. Q: Have you owned a business and what lessons did you learn from being your own boss? A: I owned a business manufacturing jewelry, I have a consulting business, and I have a real-estate business. When I was with The Southland Corp. (7-Eleven), it was like running my own business; I made career decisions every day. It takes work, effort and thought, but you can move nimbly to satisfy customers. At SLC, I defied standing operating procedures and standard business practices because I knew my customers and knew my business. As a result, I influenced corporate policy. I learned from real estate not to be greedy. It’s better to work with a tenant or take a little less rent to keep a tenant than it is to have a vacancy for a month or more. Q: What are the greatest strengths you bring to RIT? A: I am a collaborator. I like to bring people together to make something happen. I think strategically and I am a future thinker. Q: How do you define student success? A: A successful student is someone who can think critically rather than just algorithmically, who is globally mature, who can accept that people are different and appreciate and learn from those differences, who can produce results and bring value-added to the job, and who with these abilities can start a company or create value for a company by solving problems. Finally, I think a successful student gives back to others, to society. A: I like to read for leisure as opposed to reading for work, movies, playing board and card games, cooking, going to plays, hanging out. I used to ski and play tennis but my knees are shot. Although I can still hit the ball in tennis! Q: If you could learn do to anything, what would it be? A: Play piano, fix computers, sky dive, build houses, be more creative, be a better teacher, be a better writer, be a better speaker. A: I speak a smattering of several languages; when I travel I try to speak the language enough to get around. In terms of formal study, it was Latin, German, French and Chinese. As I traveled, I learned Yoruba, Swahili, Greek, Czech, Hungarian, Xhosa (a click language), Spanish, Italian, Portuguese, Korean and Japanese. A: Thirty-eight countries including Canada, Mexico, the British Isles, France, Italy, Germany, Finland, the Netherlands, Singapore, Kenya, Zimbabwe, Morocco, Vietnam, Taiwan, China, Hong Kong, Tibet, Macau, Costa Rica, Jamaica, Puerto Rico, the Bahamas and Australia. Q: Were there mentors who helped change the direction of your life? A: I’ve been lucky, and Joel Hoffman and Frank Kitchen (both from SLC) are two early mentors who made a difference when I went into big corporate. Joel taught me to be more patient and Frank taught me not to plan my career but to take advantage of opportunities as they arose. Each job I had at Southland after the first job did not exist until I had it. I also had mentors from NANBPWC Inc., Corporate Women’s Network and the National Coalition of 100 Black Women, among others. Q: How do you envision your role within the Rochester community? A: I would like to help the community improve its economic situation and create wealth for community members. Q: Do you have a strategic vision for the Saunders College five years from now? that make a difference in the world. We have all the ingredients at RIT; we just have to put them together in creative ways.